Being a parent, whether you are a working parent or a stay at home parent, is hard. Trying to juggle life each day as it comes. Not knowing when the next tantrum is going to start, wondering if you're going to get some kind of decent sleep in the night and so on. You never know what's round the corner with kids. One of my biggest downfalls since becoming a Mum is being organised. I have learnt myself new things throughout the years and being a Mum to two school children and a baby, I have to have some kind of organisation in my life. I started blogging nearly four years ago. At the beginning, it was just my hobby but for the past two or so years, it's also my income. Elliw was only part-time school before Freddie was born and I tried to do my work and house work while she was at school for 2-3 hours. I found it stressful if I had a lot to do as I have to leave the house around 20 minutes before she finished and when I was pregnant I had to make sure I left 30 minutes before because I struggled to walk. 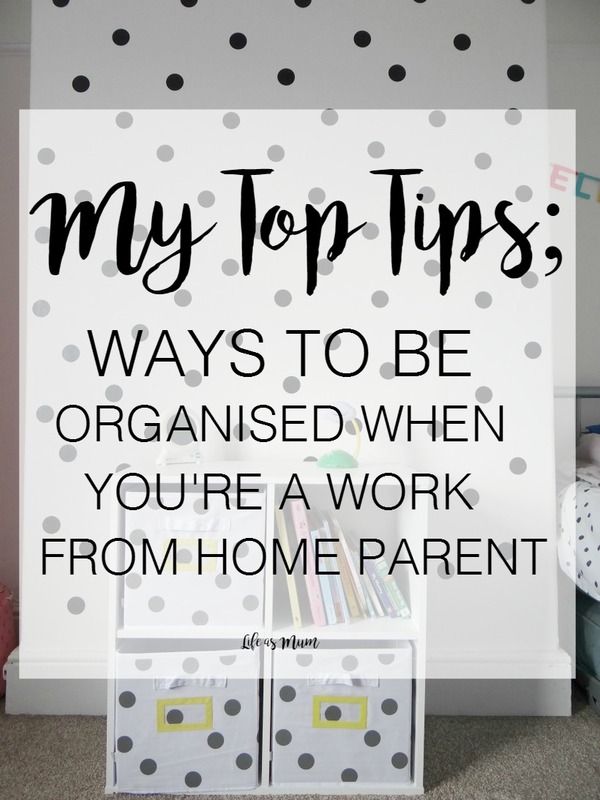 I think when you work from home and a stay at home parent too, it's so important to have some kind of organisation with work and home life. I find trying to separate the both from each other makes it a little easier. Just because you work from home, doesn't mean you can't have set hours. Having set hours can make some things a little less stressful. You know when you're starting and finishing, this means you have a deadline time to finish your work before your next start. If you have school children, you could do the set hours in between the school hours or when the kids are in bed. If you have younger children you could set these hours during nap times or during the evening when they are in bed. You've probably got a load of papers, books and all sorts with your job. Buying shelves and storage always helps make life easier. There's nothing worse than going to your workplace with everything everywhere and wasting time trying to find what you want. Having things on shelves or storage boxes will help you be organised. You could possibly label the boxes too. Each year I will buy myself three diaries. One for work, one for life such as appointments and the other for my personal use to write what I have done each day. If you're looking to be more organised as a work from home parent I'd recommend buying a diary for work and a day-to-day diary for appointments and things related. This really helps with sticking to things, remembering things and you could also add your payments too. I personally think preparing and planning are key to being organised. Especially when you have kids and working from home. Every evening, I try my best to have ten or so minutes to myself where I can plan my day ahead. Of course, it doesn't always go to plan because that's just parent life, but having a little plan for the day does help make you feel organised and some kind of motivation for the rest of the day. If you have school kids, preparing their lunch boxes, bags and school uniform the night before is a huge help and saves you so much time rushing around in the morning. Furniture at Work have created an infographic bout the organisational characteristics of the star signs in the Zodiac. I am a Leo and it's so true about me. What star sign are you?